No wonder the Israeli consulates in New York and San Francisco won’t disavow those vile subway posters: Pamela Geller is the new public face of Israel. Yes, Israel protects the rights of all citizens – unless they’re Palestinians who happen to own property coveted by the “settlers,” in which case it doesn’t. And the key word here is citizens: of course, the Palestinians in the occupied territories are not citizens, but helots, with no rights, and no protection from fanatical Jewish fundamentalists who have launched hundreds of attacks on their homes, and sought to displace them at every opportunity, with the active complicity of the Israeli government. The Israeli Prime Minister may have been addressing the UN General Assembly, but he was really talking to the Americans, whose fear and loathing of the perpetrators of the 9/11 attacks can always be counted on to raise them to new levels of hysteria. Outside that context, however, equating the Iranians with Al Qaeda makes about as much sense as likening the late unlamented Saddam Hussein to Osama bin Laden – and, hey wait, didn’t we hear that equation made endlessly in the run-up to the invasion of Iraq? Yet this was not a time for subtlety from the Israeli Prime Minister – the cartoon “bomb” ended all hope of that – but for the crudest sort of propaganda, which is, of course, war propaganda. Imagine if Palestinian leader Mahmoud Abbas, who addressed the UN that day minutes before Netanyahu took the stage, had said: “Militant Judaism has many branches, from the Washington offices of AIPAC to the center of Jewish power in Tel Aviv – but they’re all rooted in the same soil” of intolerance? Picture him conjuring images of violent Jewish “fanaticism” – not a hard task, given what is happening in Israel today. If he had done so, Abbas would have been denounced in every Western capital as the 21st century incarnation of Hitler. That this alleged champion of “modernity” should base his case on fearmongering should come as no surprise: hasn’t fear been the leitmotif of all the “modern” ideologies of aggressive nationalism? Fear of the Other, of the barbarian at the gates – the “savage” who, at the first opportunity, will tear your throat out with his bare teeth – is what keeps ideologues like Netanyahu and his American co-thinkers in business. Correct me if I’m wrong, but aren’t the Israelis also awaiting the return of Someone Special, a Messiah who will lead them out of the wilderness and establish the Kingdom of Jerusalem as His earthly domain? Militant jihadists may not be secular Marxists – but then again, militant Zionists aren’t, either. I would no more trust nuclear bombs in Bibi’s hands than I would in Ahmahdinejad’s – the difference being that the former is actually in possession of such weapons. Which brings us to the absurdity of this lecture by the leader of the only nuclear-armed country in the region: here is a nation which refuses to even admit it acquired nukes long ago, and which disdains the Nonproliferation Treaty, making the case for war against a neighbor that has indeed signed the NPT and is abiding by its requirements. In a rational world, Israel would be in the dock, answering for its unwillingness to come out of the nuclear closet and admit what the whole world knows by now. Indeed, Bibi could give us some insight into exactly how Israel stole acquired the materials to build its formidable nuclear arsenal – since, according to recently declassified documents, he was directly involved. In the world in which we are living, however, in which the innocent are put on trial and the guilty sit in judgement, the situation is quite different. In that world, the leader of a tiny nation entirely dependent on US largesse takes to the UN podium to issue his marching orders to Washington. 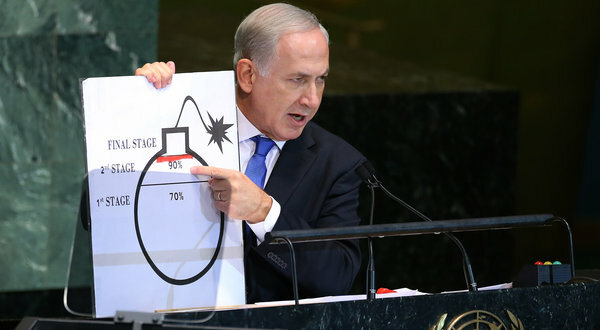 Here is my “red line,” says Bibi – daring not only the Iranians but also the Americans to cross it. Think of Netanyahu’s UN oration as just another Romney campaign speech, in which the GOP presidential candidate says Tehran must not be allowed to get “one turn of the screwdriver away” from joining the nuclear club. According to Netanyahu, Iran is nearly at that point today, and will have a nuclear weapon in less than a year if the US fails to act. This is technical nonsense, but then again the truth has nothing to do with war propaganda: to the average American, the mere possession of weapons-grade uranium means all the Iranians have to do is plug it in and hurl it, slingshot style, in the general direction of Israel. This is an impression Israeli propagandists would dearly love to inculcate in the American public, and they have the great advantage of relying on general ignorance of the technical details. Good luck explaining to Mr. Average American why it would take a good four years after they’ve weaponized their nuclear material for the Iranians to create a useable nuke. The ticking-bomb theme, which has been used to justify everything from torture to the invasion of Iraq, permeates Israeli propaganda in the US and was a cental theme of Bibi’s speech. His message was clear: “the hour is getting late.” We must act without giving too much thought to the possible consequences. Don’t delay, don’t think, act now – before the fraud is exposed, and we discover that – as in the case of the Iraqis – those “weapons of mass destruction” were just a figment of our easily manipulated collective imagination. You can follow me fighting the Twitter wars here. Previous Previous post: ‘Our (New) Terrorists’ the MEK: Have We Seen This Movie Before?